- After you are logged into OTP, click on the Settings button in the upper right corner of the main page. - Scroll down until you find the link in the left menu titled Attachments. - Click the Attachments link. It will pull up a list of all of the pictures you have uploaded to OTP in reverse date order on the date they were uploaded. - Go to the end of the list and delete a few of the oldest pictures by clicking on the checkbox on the far right side and selecting the Delete Selected button from the bottom of the screen. That should free up some space for you to be able to upload new pictures. The other option is to setup a PhotoBucket (or similar) account and just reference the pictures from PhotoBucket in your OTP posts. 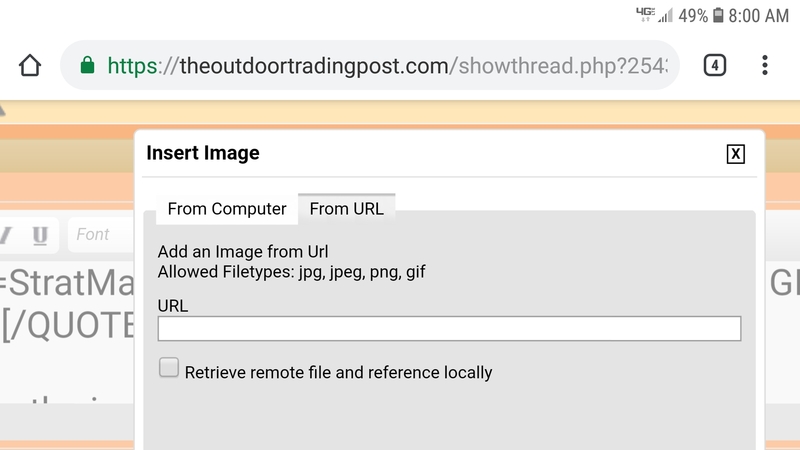 However, that will cause the OTP page to display a bit slower since it needs to retrieve the image from PhotoBucket every time it displays your post. But, your OTP account will not limit you because all of the images are stored on an external server. Another thing I think RWalls would appreciate us doing is to resize our photos before posting. As an example, when I take a photo with my phone, the image size when it is transferred to my Mac is around 7 megabytes. That is a HUGE photo. My new phone is both very high resolution and creates the photo for printing on an 8 1/2 X 11 page. So, I always resize the image before I post it. I usually drop the resolution down a bit and resize it to about 35% of its original printed size. That reduces the file size to under 100 kilobytes. That makes it upload a whole lot faster and saves RWalls a bunch of space on his server. Finally, since RWalls is financing all of the hardware/software for running this site out of his own pocket and from the donations and memberships we send in. If you are not already a VIP member, maybe consider sending him the $10 per year or whatever pittance he is asking to help support and enhance the site. Otherwise, you can continue to be a looter douchebag and I might have to pee on you if the urge strikes me at the wrong moment. Last edited by Inor; 04-13-2015 at 10:42 PM. I just upped the settings big time on album size allowed and picture size. Admin for the BEST gun site on the web! WELCOME TO THE OTP! I cannot seem to upload a GIF... pics work just fine. Just copy the image source link then paste the link into the tree thingy in the post window. When I'm on the phone I have to use my pic host. Right now I use Imgur. I hate the attachment feature because when you reach the max then you have to delete and then threads are missing pictures. I am around 18 MB Now, I dumped a lot of attachments, I did not need them anyway. I kept all of my girly shots though.